With the global expansion of ayahuasca, it is still considered to be an illegal drug in many countries – some communities are in danger of prosecution; would it be possible for ayahuasca to be recognized as a global cultural heritage under UN? Would this be a good thing, and how might we be able to arrive at a consensus of all the different stakeholders? In this interview, Haru Kuntanawa – a pajé of the Kuntanawa tribe of Acre Brazil, talks about his concerns about the globalization of plant medicines. He shares how the leaders in his community use ayahuasca in community governance, as well as the one most powerful thing we can all do to improve society. Haru is a pajé (shaman / spiritual leader) of the Kuntanawa tribe of Acre Brazil, who played a fundamental role in the process of demarcating the ancestral territory of the Kuntanawa tribe. As an indigenous political leader, Haru is active in the political struggle of indigenous rights, environmental and cultural preservation of the peoples of the Amazon. Haru is the founder of the young environmental collective of the Juruá River Valley in 2005, a youth-based organization addressing social and environmental issues. Lorna: With the global expansion of ayahuasca, it is still considered to be an illegal drug in many countries – some communities are in danger of prosecution; would it be possible to have ayahuasca be recognized as a global cultural heritage under the UN – would this be a good thing, and how might we be able to arrive at a consensus between all the different stakeholders? Haru: I believe it is possible, but there is the need of having a consensus. There must be respect, a recognition of the parts interested on protect or consecrate or whatever it is… First we need to understand what is the process. What is it for? Is this only religious, is it medicinal, is it economic? Because there are many intentions. How will we know the interest of each one? What’s the purpose that we are using ayahuasca? Is it just for a way to export and exchange, for financial gain? Or is it to separate even more people and opinions? The planet needs to undergo a deep transformation of re-education of consciousness. Where people can develop with the comprehension of understanding each other. Ayahuasca is capable of doing this, of transforming and showing the context of comprehension. If we can actually do what she says, because sensibility becomes clear. 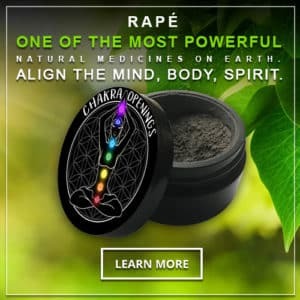 It is a word, a breath, an essence, a smudging, a bath that you will take to clear… All of this is connected to ayahuasca and it’s an ample universe that’s not just spiritual. She’s a very broad realm that needs to be studied very well. She is a political realm as well. We, particularly, drink her before we make decisions as a tribe. It’s important to not lose customs and traditions. Become stronger with that which makes you a better human being. More evolved and more conscious. There is a common ground where we can meet and where is that? It must be on the individual opinions. The way each one thinks, because I cannot tell you my way of thinking is more correct than yours. I can say you also have your thoughts too, and I have to listen to you. We must take time to listen to each other. You want the others to listen to you. But who stops and listens are very few. That really want to do it, that have the time to sit, without a schedule, looking at the clock, concerned about other things they are going to do. That is not right, we need to have time for everything, and this, human beings have to recover, the gift of having time to listen to others. I need to know how to listen and not just what is inside the technologies. For example, the matter of prohibition. What is prohibited there, in other countries, they prohibited there. Here we will not do that. I believe ayahuasca has been growing in the forest for thousands of years, but due to the evolution of civilization, is bringing concerns that have other concepts. Today we already are modernized, we have changed many things. We use technologies, we use money, other concepts that are from this civilization. Why have we done that? It has not been only by spontaneous choice. It is also because it was required, but are we going to continue complaining about this? No, we just have to find the ways, since we are already here, because we will create the transformation. Lorna: How is the use of ayahuasca in the decision making process? Haru: Particularly, I can’t speak for everyone. I do this way not because I created it, but this is the story my grandmother tells, that her mother told her, it is very ancestral. I feel good doing this way, consulting the spiritual strength of the visions to gain clarity, to make decisions that are more precise and correct. For example, if I’m part of a conversation with other people, they will have to listen to my opinion and I will have to listen to theirs and through that, if we can’t come to a consensus…an agreement, he will continue with his way of thinking and I will continue with mine. We do it in this way and might not find an understanding, a result. I believe like this, we are doing this way and I only see our community growing, evolving in sustainability, security, tranquility, peace and harmony. So this makes me very happy. Today it is a new reality…what we are doing…we are seeking to implant our reality of this new generation but also to recover our ancestral identity of the ones that have passed there. Our archeological sites, which we are discovering and maintaining as our living library of the history left by our ancestors. Soon we will become ancestors for the future generations. What are we leaving for them? Everything we are thinking is in this sense. We do not take anything from this world, but we leave our legacy to our families, those that are part of our lives. Mentioning our family is to talk about humanity and what keeps us alive. In this global context, we are all integrated, it’s a chain. Speaking of God and believing in God, just to say you believe, without a direct connection, without a proof, just to fix your issues and your mistakes, it is very easy. Talking about God with a direct contact, you might talk and be with him inside, and you have to go out and purge. Ayahuasca can do that, she heals us if we are sick. God, the Creator, lives in the clean body in the clean heart, pure. What is the pure heart, it is to know how to treat people and respect the Universe that God created. That’s why I believe that all decisions must be taken with consciousness. Whichever that is. Everything that we think. For example, I can tell you that is my feeling, it can mean nothing for you but it’s sacred for me. That is why I respect yours as the most precious thing you have, because I believe it is. This way of respect we must have, that comes with understanding. What we need to learn, is that more than having hundreds of diplomas, saying that we are doctors or scientists, it’s important to have consciousness within, to make things less harmful to society.